Hilary Mockewich, a painter educated in Florence, Italy, and the Pennsylvania Academy of Fine Art, is expected to exhibit soon at the Artisans of Mancos. 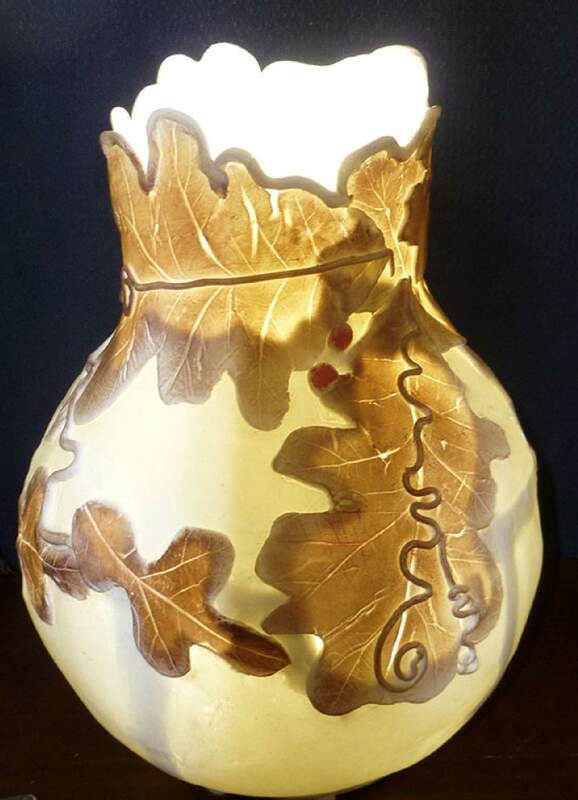 “Porcelain Lamp with Oak Leaves,” by Ann Sciba. An opening reception for Sciba will be held at Artisans of Mancos as part of Mancos Days on July 28 from 2 to 4 p.m. The Artisans of Mancos will host artist Ann Sciba, whose pottery adds a new creative expression to the group of artists. An opening reception for Sciba will be held as part of Mancos Days on Saturday, July 28, from 2 to 4 p.m.
“Please come, meet Ann, see her lovely porcelain pottery, and enjoy goodies made by artisans,” Jan Wright said in a press release. Wright, a watercolorist, has exhibited at Artisans of Mancos since 2008. She also was an artist-in-residence at Mesa Verde National Park in 2012 and at Petrified Forest National Park in 2012. When Sciba took a pottery class in 1967, she did not dream she would be using those skills for more than 50 years, Wright said. Early experience with making and selling pottery included having a shop at Santa’s Workshop, an amusement park in Cascade at the base of Pike’s Peak. “There, she made pots, demonstrating to visitors of the park and selling her work,” Wright said. She also showed with galleries in Colorado Springs, Denver and Cripple Creek. After moving back to Texas, she taught pottery in Victoria while directing the Open Door, an arts and crafts school. A move up U.S. Highway 59 took her to Wharton, a small town southwest of Houston, where she continued to make pots. During the past 15 years, she has shown her work in several galleries in Texas and at craft and art fairs across the state. Sciba moved to Cortez to live with her daughter in November 2017 and has been working in clay while organizing her new studio at home. Artisans of Mancos is at 101 Grand Ave. in Mancos, at the intersection of Main Street and Grand Avenue. For more information, call (970) 533-7040. Coming soon: Hilary MockewichHilary Mockewich is a fine arts painter educated at Scuola Lorenzo de Medici in Florence, Italy, and the Pennsylvania Academy of Fine Art in Philadelphia. His opening will be announced soon, Wright said. 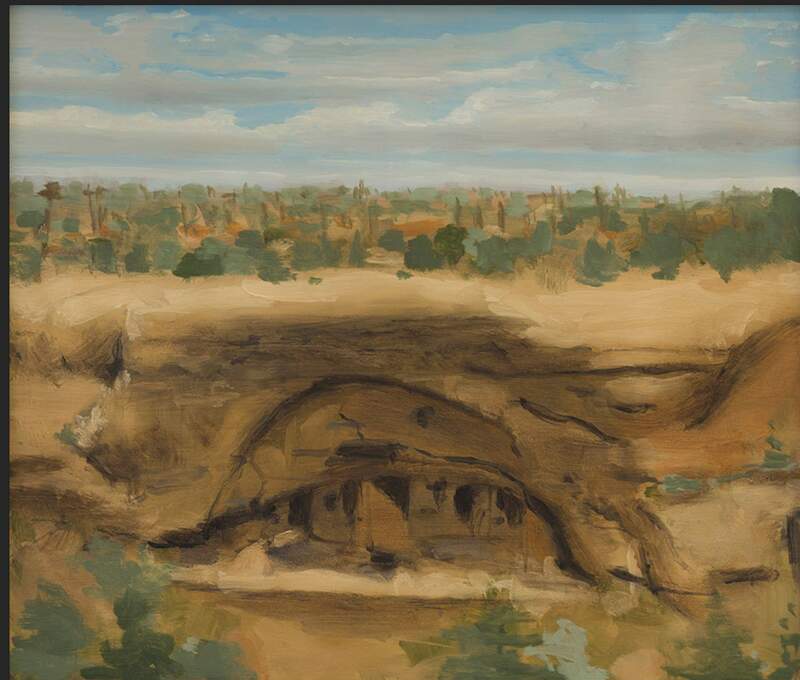 Mockewich’s most recent works include plein air landscape paintings with custom frames of the Four Corners. In addition to plein air painting, he does commission work for portraits, pet portraits, murals, Venetian plaster, gilding, decorative painting and picture frames. After completing secondary school at Burlington County Community College in Pemberton, New Jersey, Mockewich moved to Florence, Italy, where he trained and completed various commissions. According to his website, Studio Hilary Art, Mockewich continued his studies at Pennsylvania Academy of the Fine Arts and was awarded his certificate in 2006. While at the Pennsylvania Academy, Mockewich worked as a fine arts subcontractor for commercial church-painting firms and focused on his study of classical painting and drawing, according to his website. After graduating, Mockewich worked as a mural restoration technician for a studio in New York City and has since created his website, Studio Hilary Art. He lives in Shiprock, New Mexico.